Humor on the go | Run. Work. Live. Repeat. Why squat in a bush? Sometimes when you gotta go, you gotta. It’s always a delicate matter when you are a woman running a race and this happens. Now someone has come up with a way apparently to do both. How else can you explain this invention I came across on Facebook today — a “female urination device” by GoGirl?! Yes, that’s right, ladies — no more need to squat in a bush when you get off the crowded school buses for the start of the Boston Marathon and can’t find an empty potty. With this little device in tow, you can run with the boys, then try to pee like one, beside them, probably. OK, number one — no where in there did they mention RUNNERS! Hello, people?! Ever been to or visited the crowded Porta-Potty lines at a road race? And two, eeeewww! TMI (Too much information), thank you very much! It’s your business if you choose to use this device, but I’d rather not “Get to know some GoGirls.” Please keep it to yourselves! The company’s ad also promotes the use of GoGirl when visiting third-world countries. I can just imagine a confused customs officer in Mali or some such place finding this in someone’s luggage and the bizarre conversation it would spark. Oh my goodness … I do not even WANT to know what they will come up with to take care of nature’s other kind of business. I’ll suffer and wait for a real bathroom or Porta-Potty on that one. Going potty is inevitable Aging is inevitable, but growing old is a choice. Lace up your shoes, and let’s go! Mileage today: 10; Denver to Boston miles logged: 1,393; 377 to go. Today’s blog goes out to fans of campy comics or those of you who’ve spent waaaaaaay too much time indoors lately like me. She steps onto the treadmill, stealthy as the night. The wee hours of dawn and the evening’s dusk cloak her alter ego as she creeps from the shadows. By day our heroine is an ordinary suburbanista/rebel writer. She feeds her hungry urchins peanut-butter-and-jelly sandwiches, slaves over casseroles for her wayward, ESPN-fixated husband, and pieces back together minutia in her three-bedroom, two-and-a-half bath, HOA-approved lair. The moment darkness falls upon the snow-covered streets of her subdivision, however, her true identity comes to light. It is only then she emerges from the lair’s requisite five-piece master bathroom wearing sweat-wicking Spandex and the indomitable spirit of the woman warrior. 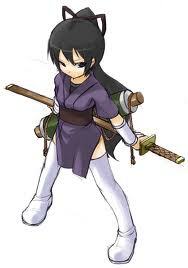 Her transformation completed her spirit lets out its feral cry: Hiiiiiiyyyyyyaahh!! Ninja Mutant Runnergirl, one with the whirrr, whirrr, whirr sound of the treadmill and the pounding of her Saucony shoes. Nay, not cold, not ice or snow, not school closings and not runny-nosed preschoolers could keep our steel dove away from her mileage mission and sway our winter running champion’s heart. For three straight workouts at the gym she’s slain the dragon of boredom on the machine’s conveyor belts with the lionheart of a black belt fueled by mere water, endorphins and too much CNN. When will Ninja Mutant Runnergirl see sunshine and daylight, and run outside again like the free-spirited creature she was born to be? The Weather Channel predicts it on Saturday but no one knows for sure. The keen instincts of our femme fatale tell her to trust no one in unchartered territory; the same goes for Doppler radar. What’s certain is, come dusk or dawn, when aforementioned urchins and wayward husband sleep or play in blissful ignorance of her absence, Ninja Mutant Runnergirl will rise again like the great Phoenix, mileage log in hand, water belt on hip, and stride fiercely where even other intrepid hearts shrink. Maybe she’ll brace her nerves and mutate to run as one with the “dreadmill” once more? Maybe she’ll pounce with the force of a tigress on the indoor track instead? Or maybe, just maybe, the weather will break, the temperature will rise, all her children will go to school healthy again, and she’ll take to the streets, freshly transformed into Urban Ninja Runnergirl, in her neighborhood, or yours. Stay tuned and hold onto your nunchucks. Go, Ninja Mutant Runnergirl, go! Aging is inevitable, but growing old is a choice. Lace up your shoes, and let’s go!! Ninja mileage today: 7; Denver to Boston miles logged: 1,226.25; Miles left to go: 543.75. I found this clip on YouTube. It shows Cardioke’s creator, Billy Blanks Jr. of Tae Bo video fame, in action as he combines high-impact cardio with karaoke singing. My children cracked up watching it, too. I found out about “Cardioke” from my friend Pam. She tried it the other day when she was stuck at home and said it was goofy but lots of fun. Just the name of it made me laugh so I had to go online and find it for myself. I must say, just watching Billy bob and sing made me feel giddy. He certainly is charming! The only problem if I did it: I’m a terrible singer, truly tone deaf. I can play the piano but even Tarzan begs me to stop when I break into a tune. I doubt my local gym offers a Cardioke class but if it did, I might try it. What I lack in musical abilities I make up for in guts. I figure anyone else brave enough to be there, too, would be self-conscious as well and not paying attention to me anyway. Plus, if they did overhear me, I’d make them and myself laugh. The world can always use more humor. After I finish this post I’m going to see if I can buy and download “Cardioke” on demand somewhere as my back-up plan for cross training. Then I can bob and croak with Billy myself until this cold snap abates if I need to. But don’t worry. I promise not to sing to you if I do. Aging is inevitable, but growing old is a choice. Lace up your shoes, and let’s sing go! Wallace said it but anyone who’s called New Mexico home can confirm it, including me. There’s no other place on the planet like New Mexco. The correct response: Christmas, which means a bit of both and the way I like it. It was in the “Land of Enchantment” or “Land of Entrapment” (for those of us who eked out a living there) that I ran with none other than the “Big Bad Gunslinger” himself, Hal Higdon. Actually, the “Big Bad Gunslinger from out of town” is not what I called him or the way I thought of him, but how Hal Higdon referred to himself in a cyber piece about running with me on his visit to Santa Fe more than 10 years ago. He found me, or I should say someone to run with (can’t say it was me in particular he sought), through the local running club, which it turns out I was the president of at the time. I don’t know if it was his “big bad” reputation (he ran a 2:21 marathon PR in his heyday) or it simply didn’t work out for anyone else’s schedule, but he got middle-of-the-pack me, not some younger male verson of himself, by default. So here’s where the Lew Wallace quote fits into the equation with Mr. Gunslinger. We didn’t run on official trails, per say, but as anyone who’s spent significant time in New Mexico, and Santa Fe in particular, knows, only the best neighborhoods have dirt roads. Again, I’m not kidding or making this up or being sarcastic. Truly, there are many, many exclusive, beautiful homes in Santa Fe, these charming old adobe abodes as well as “fabodes” on steroids (the newer fake adobe ones), all on dirt roads. People spend beaucoup bucks to build them, then rely on the city or county to grate their roads regularly, especially in the winter, to get out of their driveways. And the best way to get this done? Buy doughnuts for the local guys who’s jobs it is to do this for you regularly. Again, I’m not kidding. That’s how things work in New Mexico. Anyway, the area where I took Hal, mainly the north and upper east sides of Santa Fe, is mostly unpaved so you sort of get the benefit of trail running on dirt, minus the single track. To compensate for the lack of single-track ambience, however, you get plenty of angry local drivers who try to run you off the road. I took Hal on what my friend Suzanne called “Danica’s Run” because I made up this course. It started at Fort Marcy Recreation Center in Santa Fe and wound itself up and through neighborhoods off the ski hill road, on ski hill road for a bit, down to upper Canyon Road, onto Canyon Road (yes, the famous Canyon Road with all the famous artists and galleries), by St. John College, through town and back to Fort Marcy. It wasn’t all dirt but probably about 75 percent was and some steep grades to match. It was one of my favorite runs in Santa Fe and he liked it, too. I can’t say my pace impressed him but I think my choice of course and the views did. We enjoyed our conversation and he sent me a copy of the article he wrote. So there you have it, my brush Mr. Gunslinger and one of my favorite unofficial trail runs in Santa Fe. I came up with “Danica’s Run” in the era before Santa Fe’s Dale Ball, which was written up in Runner’s World, was built. I will talk about that particular trail yet in another post. Last night the garage door opener broke when we got home from our trip to Albuquerque. I asked my husband if he could fix it, secretly wishing that he’d turn into MacGyver so I wouldn’t need to call a repairman in the morning. But neither he nor the door budged. He simply disconnected it so we could open and shut it manually. My husband proceeded to unload the car, then himself in front of the TV where he watched football until it was time to eat. I, meanwhile, unpacked my bag and the children’s bags, started two loads of laundry, picked up around the kitchen, and made dinner for everyone. It then occurred to me: MacGyver my husband ain’t, but he sure knew how to channel “The Dude” from “The Big Lebowski” without the beer and bongs. And MacGyver He Ain’t (aka, my husband) certainly had “tapering” down. Tapering is the recovery period before you run a marathon where you cut down your mileage a lot, eat more, and wind down before the race so you can have the stamina and push to go the whole distance. In short: you get to be lazy before you work very hard. “The Dude” from “The Big Lebowski” appears to be in a perpetual state of “tapering” minus any marathons in sight. I find there are always more miles to run, children to feed and dress, soccer games to shuttle someone to, writing work to squeeze in between school drop-offs, dust bunnies in the corners and mail piles the size of mountains, laundry to be washed, groceries to be bought, dinners to be cooked, etc,, etc. My husband can rattle off NFL stats and stock market data from his job. I know the characters from “The Puppy Place” series my second-grader reads from volunteering in her classroom. MacGyver He Ain’t makes no pretenses about to-do lists like me. In fact, his version of being handy is pulling out the checkbook. This doesn’t mean he does not rise to the occasion when needed or isn’t a decent guy. He is. In fact, when Tarzan, our 4-year-old, got carsick on the ride home from Albuquerque he cleaned out the barf-mobile while I hosed down the poor kid. But let’s face it: the dust bunnies and paper piles will always be there. I can’t help but think that as I prepare for Denver Rock N Roll Marathon this weekend, perhaps I should take my tapering more “seriously” and channel my inner “Dude” from “Lebowski” like my husband? Just don’t ask me to watch football or learn any NFL stats. This is my second balloon blog from Albuquerque, N.M., where my family and I are now. “Albu-quirky” is a good place to taper before a marathon as long as you don’t overdo it on the cheese, chile and margaritas. 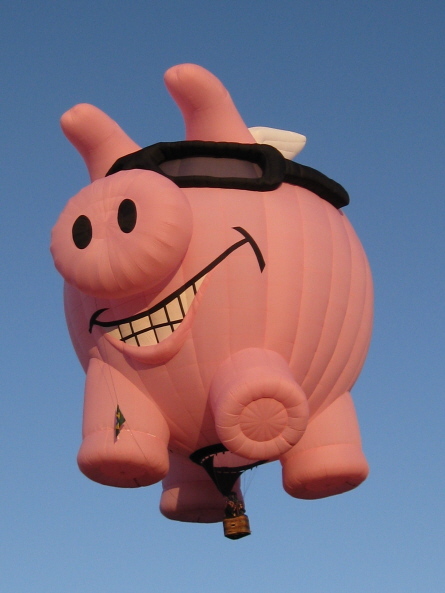 And where else can you see pigs fly at 7 a.m., along with a 40-foot-wide SpongeBob, Darth Vader, and Pepe La Pew? This morning’s mass ascension at the Balloon Fiesta looked like a giant toy mobile floating above our heads with hundreds of hot-air balloons of every shape, size and color. 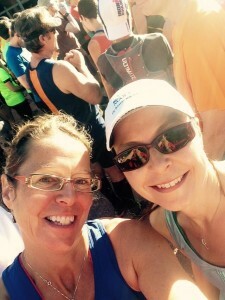 Some of my other favorite races in New Mexico include The Santa Fe Run Around 5K/10K, the Baylor Pass Trail Run in Las Cruces and the Taos Half Marathon. I could go on and on about New Mexico but I will wrap it up quick today as I’m on a hotel computer until I get home. 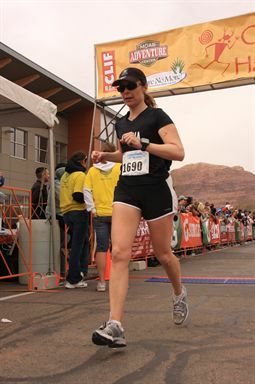 I plan on sharing more about running in “The Land of Enchantment” in my future posts. Mileage today: 4; Denver to Boston miles logged: 699; Miles left to go: 1,071. Jane has dozens of lovely, intact dolls she can play with, especially Barbies and even another Ken doll, yet for some reason she refuses to part with him. Poor Headless Weirdo looks just how I feel when I need to go running but for some reason can’t — half functional and mentally decapitated. The worst was the postpartum depression I endured after Tarzan was born, before I got the doctor’s approval to start running again. Those first few months were some of the darkest in my life. Within six months I suffered two bouts of mastitis (breast infections) while I nursed; went on two different depression medications, one of which jacked me up so much I could not sleep at all; developed eczema on my breasts from a nursing bra; and got strep throat four times, back-to-back. Looking back on it I’m not sure how my family and I made it through. I only know this for certain, running saved my life and sanity. Endorphins made a dent where Prozac couldn’t help. I am not saying this is for everyone. Medications do work for others and save lives; they just weren’t the thing I needed to reattach my head. I still go through ups and downs, but luckily running still works for me and keeps my head in place. Mileage today: 8; Denver to Boston miles logged: 651; Miles left to go: 1,119.